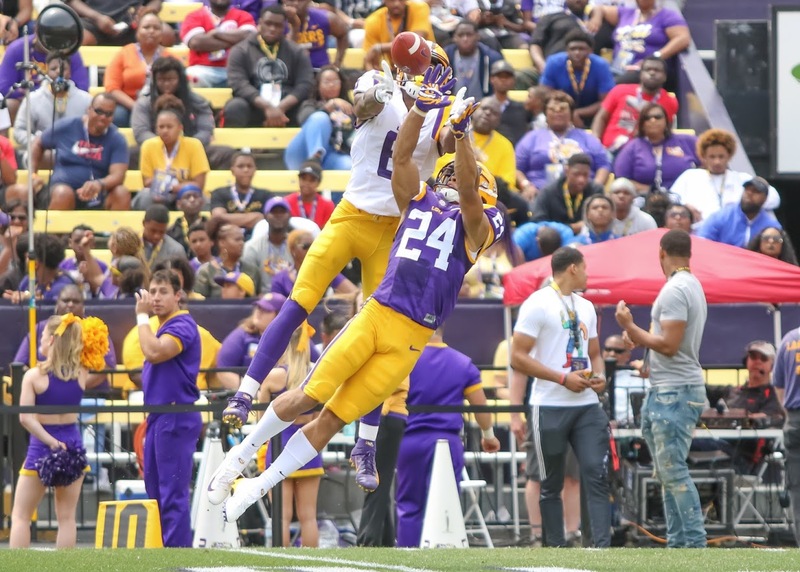 LSU wasn’t going to go too deep into the new RPO-heavy playbook in Saturday’s spring game — no reason to give up the element of surprise in a glorified scrimmage — but some of the things new passing game coordinator Joe Brady brings to the table were on full display. Justin Jefferson, Ja’Marr Chase and Terrace Marshall lined up all over the field for the first-team offense. Sometimes they were all split to the same side of the formation. At other times there was a fullback or tight end spread out along with the receivers. 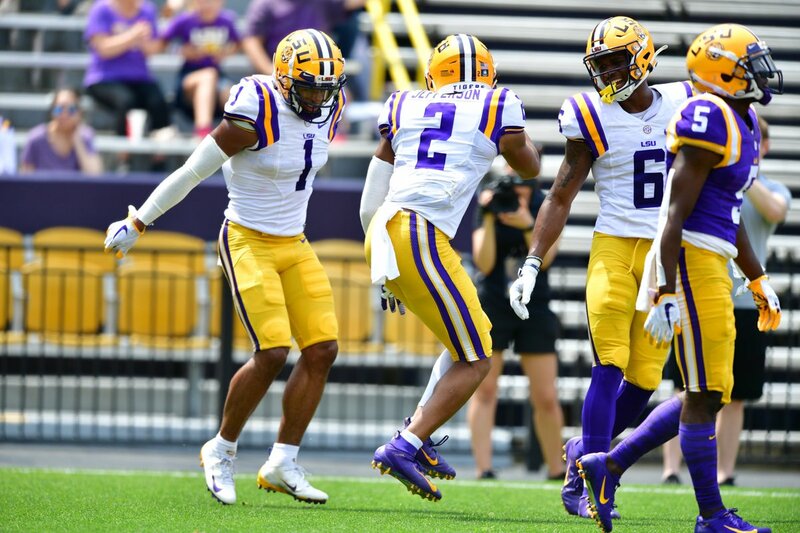 How and where ever LSU deployed its three-headed receiving monster, it was clear that they are going to be a handful for opposing secondaries to deal with this season. And that’s with plenty of innovation and installation still to come. LSU’s first-team offense, orchestrated by Joe Burrow, played the entire first half together. The starting group sans Burrow stayed in the game and played most of the second half with Myles Brennan behind center. The trio of Jefferson, Chase and Marshall hauled in a combined eight passes for 91 yards in what looked like precise short passing attack executed at a high tempo. Jefferson, still the go-to guy, shook free in the end zone and make a leaping grab off a Burrow scramble drill for the group’s lone touchdown. Add in big-bodied targets like Stephen Sullivan and Dee Anderson, a reliable slot receiver like Derrick Dillon and a stable of running backs – one that’ll get deeper once John Emery and Tyrion Davis enroll this summer — and its obvious LSU has plenty of weapons to make its new spread offense dangerous. The role those running backs will play in the passing game is something Orgeron specifically credited Brady for bringing with him from the New Orleans Saints. Clyde Edwards-Helaire caught four passes and Lanard Fournette caught three as quarterbacks made a concerted effort to check down if the initial reads weren’t there as opposed to holding on too long. 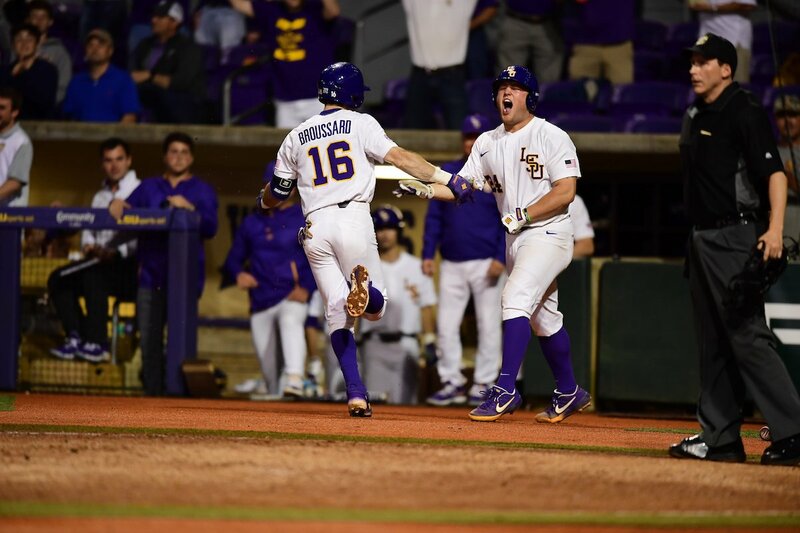 The Spring Game was a showcase for an offense that could be more explosive, up-tempo and modern than any previously used at LSU, but there’s one major question mark that remains. Orgeron mentioned it in that first quote above: pass protection. LSU played the spring game missing its best edge rusher (K’Lavon Chaisson) and top defensive end (Rashard Lawrence), and the team’s returning sack leader (Michael Divinity) shifted to inside linebacker. Still the first-team defense racked up seven sacks on the afternoon.